Health maintenance and disease avoidance are clearly important aspects of an active and productive life. It has become evident in recent years that a major factor in maintaining optimal health depends on the proper functioning of our complex gastrointestinal system. Unfortunately, gastrointestinal disorders are very common and encompass more than 40 acute and chronic conditions of the gastrointestinal tract ranging from common digestive disorders to serious, life-threatening diseases. Digestive diseases, which include gastrointestinal and liver disorders, are common across Europe, causing more than 500 000 deaths in 2008 in the 28 EU member states and more than 900 000 deaths in the whole of Europe, including Russia and other non-EU states . In the USA it is estimated that 8% of the population have chronic digestive diseases, 6% have acute episodes of digestive diseases and 43% have intermittent digestive disorders . Digestive diseases are the second leading cause of disability due to illness in the U.S., with more than 2 million Americans impaired to some degree. The total economic cost associated with digestive diseases has been estimated at more than $50 billion annually. Clearly understanding the gastrointestinal tract and its effective management are crucial for effective health maintenance. Gastrointestinal health is influenced by four major components; namely, the microbiome, the gastrointestinal mucosa, the diet and the interaction with pathogens from the environment. The microbiome is the population of microorganisms which have colonized the gastrointestinal tract. The inner wall of the gastrointestinal tract forms the mucosa which is composed of the digestive epithelium, the gut-associated lymphoid tissue and mucus overlying the epithelium. Food ingredients in the diet inevitably interact with and modify the microbiome. The ingestion of food also brings with it the risk of introducing pathogens into the gastrointestinal tract which also interact with the microbiome. It is now well accepted that the microbiome has a major impact upon gastrointestinal health and managing the microbiome is crucial for health maintenance and disease avoidance. It has long been recognised that the gastrointestinal tract contains a very large population of various microorganisms. It includes bacteria, fungi, archae, protozoa and viruses. This population of microorganisms is commonly referred to as the microbiome. This is not strictly correct in that “microbiome” actually refers to the collection of genomes of microorganisms in a system and “microbiota” refers to the collection of microorganisms. However, the term microbiome is commonly used for the microbial population of the gastrointestinal tract and it is so used in this review. The microbiome of course also includes their genomes. The size of the gastrointestinal microbiome is not easy to estimate and for many years was generally considered to be 10 times the number of human cells in the body. However, more recent estimations have substantially reduced this. Within the gastrointestinal tract, the colon is the dominant contributor to the total bacterial population, while the stomach and small intestine make negligible contributions. The colon contains an estimated 3.9 x 1013 bacterial cells. The estimated total cell number of human cells in a 70 kg man is 3.0 x 1013. This gives a bacterial cell: body cell ratio of 1.3 . However, a population of 3.9 x 1013 microorganisms is still an extremely large number and it should not be surprising that the microbiome will exert multiple influences upon human health. Over 90% of the bacteria in the microbiome belong to two phyla (major divisions in classification), Bacteriodetes and Firmicutes. Some of the most commonly found genera of bacteria in the microbiome are; Bifidobacterium, Lactobacillus, Bacteroides, Ruminococcus, Clostridium, Escherichia, Streptococcus and Staphylococcus. Various species of the Bifidobacterium, Lactobacillus, Bacteroides and Ruminococcus are generally considered health-promoting, whereas species of Clostridium, Escherichia, Streptococcus and Staphylococcuss can be pathogenic. Therefore, the balance between the different bacterial species has a major impact upon our health. If the normal balance is disturbed we have a condition known as dysbiosis, an imbalance between commensal or harmless microorganisms and pathogenic microorganisms. Although the major species of bacteria in the microbiome are listed above, over 1000 different species have actually been detected by analysis of faecal samples. However, any one individual usually only has about 160 of these species in their microbiome . Clearly the microbiome is an extremely large and complex association of microorganisms. Therefore, it is important for our own health and welfare that the activity of the microbiome is directed towards health maintenance and disease avoidance. The population of microorganisms in the microbiome produces a vast range of products. Fermentation of fibre and protein by bacteria in the large bowel produces short chain fatty acids, acetate, propionate and butyrate, which act as key sources of energy for colorectal tissues and maintain tissue integrity. Short chain fatty acids are also absorbed into the bloodstream and impact immune function and inflammation in tissues such as the lung. However, some protein fermentation products such as ammonia, phenols and hydrogen sulphide can also be toxic. Bifidobacterium can generate vitamins such as K, B12, Biotin, Folate, Thiamine . Synthesis of secondary bile acids, important components of lipid transport and turnover in humans, is mediated via bacteria such as Lactobacillus, Bifidobacterium and Bacteroides. Numerous bioactive lipids are produced by bacteria, including lipopolysaccharide, a component of the cell wall of gram negative bacteria that can cause tissue inflammation. In addition to the synthesis of many compounds, the genes in the microbiome allow the production of many enzymes which our own body cells cannot produce. This supply of extra enzymes influences digestion and health. Indeed, much of the microbial diversity in the human gastrointestinal tract may be attributed to the spectrum of microbial enzymatic capacity needed to degrade nutrients, particularly the many forms of complex polysaccharides that are consumed by humans and are not digested in the small intestine. The Bacteroidetes are specialized in the breakdown of complex plant polysaccharides and so the introduction of plant derived carbohydrates into the diet would boost populations of Bacteroidetes . On the other hand, low levels of Bacteroidetes in the microbiome are correlated with obesity, which itself may result from a diet low in plant-derived polysaccharides. Bacterial phytases of the colon degrade phytic acid present in grains, releasing minerals such as calcium, magnesium and phosphate and making these available to host tissues. Enzymes which degrade mucins help bacteria meet their energy needs and assist in the normal turnover of the mucus barrier lining the gastrointestinal tract . An important characteristic of the microbiome is the great diversity among individuals. This is much greater than the genomic variation of the body. Individual humans are about 99.9% identical to one another in terms of their host genome, but can be 80-90% different from one another in terms of the gastrointestinal microbiome. This suggests that exploiting the variation contained within the microbiome will be much more fruitful in personalized medicine than the use of an individual patient's genetic data that targets the relatively constant host genome . In view of the multiple effects of the microbiome in health and disease, it is important that a beneficial microbiome is rapidly established in the young infant. Although gastrointestinal bacterial colonization begins when a foetus is in the lower uterus, an infant's microbiome is only fully established after birth. A major factor contributing to the variation in the infant microbiome is the mode of delivery at birth. Infants born vaginally have a microbiome very similar to that of their mother’s vaginal and faecal microflora. This occurs through vertical transfer of the vaginal-perianal microbes of the mother as the infant passes through the birth canal. For vaginally-born infants, Lactobacillus, Prevotella, or Sneathia spp. dominates the microbiome but within months there is a greater distribution of Bifidobacterium and Bacteroides . In contrast, the microbiome of an infant born by caesarean section comprises bacteria transferred horizontally from the mother’s and others’ skin surfaces and, to a lesser extent, the place of birth. This tends to result in an infant microbiome dominated by Staphylococcus, Corynebacteria, and Propionibacterium spp. with lower proportions of Bifidobacteria and Bacteroides spp. These differences in initial new-born microbiomes may have important health consequences since the genera Bifidobacterium and Lactobacillus are considered to be health protective whereas some Staphylococcus and Clostridium spp. have pathogenic potential. In addition to differences in bacterial genera, the intestinal microbiome of infants born surgically shows less diversity compared to vaginally delivered infants. This is potentially important since, in general, increased diversity of microbes within the gastrointestinal tract is considered protective, while low diversity has been linked to a variety of human diseases, including inflammatory bowel disease and obesity. Thus, delivery mode appears to be an important factor in the development of the infant microbiome, since surgically delivered infants miss the unique opportunity to be inculcated with their mother’s vaginal microbiome via the birth canal. The microbiome starts to assemble immediately after birth, and during the first year of life, the infant diet is one of the most important factors that shape the microbiome. The influence of diet on microbiome development is clearly illustrated in infants with different feeding routines, namely breast milk feeding and formula feeding. Breast milk feeding promotes infant health by guiding the proper assembly and activity of the gut microbiome . This is an important benefit from breast milk since inadequate colonization during early childhood may lead to dysbiosis (or an imbalance between commensal and pathogenic organisms) which may increase susceptibility to a variety of immune-related pathogenic states . The benefit of breast feeding is related to the quality of human milk which contains proteins, fats, carbohydrates and various immunoglobulins. The carbohydrate fraction of human milk comprises between 5 and 23 g/L of specific oligosaccharides containing a lactose-reducing end elongated with fucosylated and/or sialylated N-acetyllactosamine units. The human milk oligosaccharides (HMO) are the third most abundant components in milk after lactose and lipids and they are composed of various monosaccharides namely, glucose, galactose, fucose, N-acetylneuraminic acid and N-acetylglucosamine . Infants lack the enzymes necessary to digest HMO so most reach the colon unmodified where they can influence the development of the microbiome. In the colon they are fermented, mainly by Bifidobacterium and Bacteriodes species, to produce short-chain fatty acids. Only a few Bifidobacterium and Bacteroides species can use HMO as the sole carbon source. Therefore, HMOs have a clear prebiotic effect by selectively stimulating the development of a Bifidobacterium-rich and Bacteriodes-rich microbiome. In addition, HMO is also considered as anti-adhesive antimicrobials . To colonize or invade host cells most bacterial, viral or protozoan pathogens need to adhere to carbohydrate structures or receptors on the cells of the gastrointestinal tract. Various HMO resemble these receptor structures and act as decoys when the pathogenic microorganisms bind to the HMO instead of the cells of the gastrointestinal tract. This reduces the risk of viral or bacterial infections since the pathogens are excreted together with the undigested HMO. Formula-fed infants lack the benefits of HMO and exhibit a microbiome with a significant presence of species of Staphylococcus, anaerobic Streptococcus, and Clostridium in addition to Bifidobacterium. Some studies have shown that exclusively formula-fed infants are more often colonized with E. coli, C. difficile, B. fragilis group, and Lactobacilli than those that are exclusively breast-fed. Recently, milk formulas have been improved, notably by the inclusion of some HMO, which makes it possible for a formula-fed infant to establish a Bifidobacterium-rich microbiome. However, compared with breast-fed infants, formula-fed infants still have distinctive features of their microbiome such as the over representation of C. difficile . During lactation, the microbiome is predominantly comprised of Bifidobacterium. At the onset of the weaning period, with the introduction of solid foods and the continuation of breast milk feeding, an adult-type complex microbiome dominated by the phyla Bacteroidetes and Firmicutes becomes established. At about three years of age humans acquire a stable microbiome dominated by Bacteroides, Prevotella, and other Firmicutes. In a normal, healthy individual, the gastrointestinal tract has a microbiome populated by a diverse array of microorganisms which display immune homeostasis marked by oral tolerance to commensal bacteria and benign antigens. The microbiome in adults is relatively stable from 20 to 75 years old. In elderly people the microbiome changes. Though both Bacteroidetes and Firmicutes are dominant in the adult and elderly microbiome, distinct changes occur in the Firmicutes subgroups, with multiple members in this phylum decreasing in number with increasing age. Conversely, there is an increase in the proportions of facultative anaerobes, such as Staphylococcus and Bacillus, and Proteobacteria such as E. coli in older age. Bifidobacteria decrease in the elderly, a strain considered to be an important probiotic with functions in maintaining microbiome homeostasis and preventing pathogenic infection. In humans, diet plays a primary role in generating compositional change and diversity in the microbiome as dietary patterns progress over the first three years of life. Major shifts in the taxonomic groups of the microbiome have been observed with changes in diet such as weaning to solid foods. The introduction of table food to the breast-fed infant causes a rapid rise in the number of enterobacteria and enterococci, followed by progressive colonization by Bacteroides spp., Clostridium, and anaerobic Streptococcus. In formula-fed infants, however, the transition to solid food does not have as great an impact on gastrointestinal flora. As the amount of solid food in the diet increases, the bacterial flora of both breast- and formula-fed babies approach that of adults with a co-dominance of Bacteroidetes and Firmicutes and a more stable community composition . Dietary alterations can induce large, temporary microbial shifts within 24 h . Therefore, it is important that an appropriate diet is available throughout life to ensure adequate development and maintenance of the microbiome. In the adult the microbiome has the ability to breakdown plant polysaccharides and xenobiotic compounds as well as vitamin biosynthesis. The Bacteroidetes are specialized in the breakdown of complex plant polysaccharides and so the introduction of plant derived carbohydrates into the diet would boost populations of Bacteroidetes. Consistent with these observations, low levels of Bacteroidetes in the microbiome are correlated with obesity, which itself may result from a diet low in plant-derived polysaccharides. Thus, together these results further support the notion that a diet high in plant material promotes a microbial community structure and metabolite production that is beneﬁcial to the human host . Short-term consumption of diets composed entirely of animal or plant products rapidly alter the microbiome. A diet based on foods of animal origin increased the abundance of bile-tolerant microorganisms (Alistipes, Bilophila and Bacteroides) and decreased the levels of Firmicutes that metabolize dietary plant polysaccharides (Roseburia, Eubacterium rectale and Ruminococcus bromii). In a study of 98 individuals there was an association between Bacteroides enterotypes and high animal fat or protein diets, while the Prevotella enterotype was associated with a high carbohydrate diet . A high-saturated fat diet seems to increase counts of total anaerobic microflora and the relative abundance of Bacteroides and Bilophila . Microbial activity mirrored differences between herbivorous and carnivorous mammals, reflecting the comparison of carbohydrate and protein fermentation. These results demonstrated that the microbiome rapidly responds to an altered diet. Prebiotics are interesting candidates to support the microbiome. These are non-digestible food ingredients that have a beneficial effect on the microbiome, through their selective metabolism in the gastrointestinal tract . As discussed above HMO act as prebiotics and are not utilised for growth of the body but play an important role in establishing an effective microbiome in infants. Prebiotics have an enormous potential for modifying the microbiome . Fruit, vegetables, cereals, and other edible plants are sources of carbohydrates constituting potential prebiotics. There is a wide range of commercially produced prebiotics such as; beta-glucans, cyclodextrins, fructooligosaccharides and inulin, galactooligosaccharides, lactulose and maltooligosaccharides. The prebiotics can selectively support the growth of gastrointestinal bacteria, promote immune functions and show anti-viral activity. Some of them are able to promote mineral absorption and regulate metabolism. Supporting the microbiome is another and possibly neglected aspect of human nutrition. Generally good nutrition is directed towards fulfilling requirements for protein, energy, vitamins and minerals in terms of growth of the body. However, nutrition also now needs to be directed towards efficient management of the microbiome as this has an overriding effect upon health maintenance and disease avoidance. In the future we need to ensure that nutrition supplies nutrients for the human body and also supplies adequate nutrients for the microbiome. Starting from birth the gastrointestinal microbiome is of fundamental importance for human and animal health because it helps in maintaining homeostasis of the gastrointestinal tract. The microbiome serves as a barrier against the proliferation of pathogenic microorganisms. It plays an important role in the digestion and metabolism of colostrum, breast milk, formula, and weaning foods in infants, and a wide variety of foods in adults. It is also active in the breakdown of toxins and drugs, in vitamin synthesis and in ion absorption. The microbiome produces immunomodulatory metabolites such as short-chain fatty acids and is important in maintaining the immune system including tolerance to food antigens. Short chain fatty acid such as butyrate, propionate, and acetate also act as a major energy source for intestinal epithelial cells and may therefore strengthen the mucosal barrier. Moreover, the gastrointestinal microbiome allows the synthesis of beneﬁcial nutrients such as vitamins . It is also involved in protein catabolism. The microbiome in the colon is a site of heavy proteolytic activity since it receives around 12–18 g proteins every day. The proteolytic activity in colon has been mainly attributed to the genera Bacteroides, Clostridium, Propionibacterium, Fusobacterium, Streptococcus, and Lactobacillus . As previously discussed enzymes from the microbiome also improves energy harvest from dietary components with low inherent potential such as complex carbohydrates and phytic acid. The microbiome has profound effects on the development and physiology of the host immune system in early life and affects health and disease in later life. The development of a microbiome is necessary for normal immune system development, as indicated by the loss of immune function in germ-free mice . Several of the metabolites produced by the microbiome also stimulate the neuroendocrine cells in the gastrointestinal tract and therefore, the microbiome plays an important role in the endocrine regulation of gastrointestinal functionality. Therefore, the microbiome contributes to the regulation of the host homeostasis by contributing to optimal digestion and absorption of nutrients, regulation of energy metabolism, prevention of mucosal infections, modulation of the immune system and endocrine regulation . Numerous diseases in both adults and infants have links to the microbiome, including stomach cancer, mucosa associated lymphoid tissue lymphoma, inflammatory bowel disease, obesity and necrotizing enterocolitis. Disruption of the microbiome in young mice leads to long-term changes in visceral pain perception, characteristic of stress-related disorders such as irritable bowel syndrome . Various studies across different animal species have reported changes in microbial communities in acute and chronic gastrointestinal diseases. The most commonly observed changes are decreases in the bacterial phyla Firmicutes (i.e., Lachnospiraceae, Ruminococcaceae, Faecalibacterium) and Bacteroidetes, with concurrent increases in Proteobacteria (e.g., E. coli). However, it is now evident that the microbiome not only influences events in the gastrointestinal tract but also has a long-distance effect exerting an influence remote from the gastrointestinal tract as far as the brain. Whilst the ability of the brain to regulate the function of the gastrointestinal tract has long been recognized, only in the last decade has the bidirectional nature of this relationship been elucidated. It is now recognised that the microbiome influences the function of the brain and central nervous system through metabolic, neuroendocrine and immune systems and impacts upon cognitive development [23,24]. This has led to a relatively new concept of the presence of a pathway of communication between the gastrointestinal tract and the brain, modulated by the microbiome. This has given rise to the term “microbiota-gut-brain” axis. This concept attributes functions to the microbiome to modulate brain plasticity and influence early development of normal social and cognitive behaviours such as learning and memory. Management of the microbiome by dietary means now has the potential to improve both the physical and emotional well-being in humans. It also offers the possibility as a treatment for conditions as diverse as irritable bowel syndrome, anxiety, depression and Alzheimer’s disease . Another important function of the microbiome may be in cancer therapy. Bacteria are known to modulate the anti-tumour efficacy of various chemotherapeutic and immunotherapeutic agents . In a clinical trial, patients that responded to an anti-cancer therapy had a high abundance of Faecalibacterium genus in the microbiome. Non-responding patients however displayed a high abundance of Bacteriodales in their microbiome . These results suggest that the microbiome may modulate responses to an anti-cancer immunotherapy in melanoma patients. There may well be a therapeutic advantage in modulating the microbiome of patients receiving an ant-cancer immunotherapy. Obviously, a healthy microbiome is desirable but definition and measurement of health is difficult. Commonly health is defined as the absence of disease. Also, although many studies of the microbiome focus on disease, a better understanding of the healthy microbiome would it help to develop new microbiome diagnostics and therapeutics . Enrichment of the infant microbiome in species such as Bacteroides, Parabacteroides, Clostridium, Lactobacillus, Bifidobacterium, and Faecalibacterium prausnitzii are proven determinants of a healthy microbiome. Once established, these are the main producers of short chain fatty acids which are an important source of energy from non-digestible carbohydrates. Many plant foods are rich in non-digestible carbohydrates so the microbiome plays an important role in helping utilization of these food components. The short chain fatty acids are valuable compounds as they are immunomodulatory, inhibit common pathogens, and may possess tumour-suppressive properties. Development of the microbiome is an essential requirement for immune system education and the establishment of these beneficial genera early in life promotes immune tolerance and can consequently attenuate or abrogate autoimmune diseases . An important parameter of a healthy microbiome is stability which incorporates resistance and resilience . Stability depends upon the ability of the microbiome to resist change in response to stress (resistance) or to return to an equilibrium state following a stress-related perturbation (resilience). For example, a healthy microbiome has the ability to resist perturbations due to the entry of a pathogen, alteration of the diet, or administration of medication such as antibiotics and to return to a healthy state afterwards. After an antibiotic treatment, the healthy microbiome generally recovers to its previous state after a few weeks. The ability of the human microbiome to remain stable in the face of continuous and potentially disruptive perturbations is important for health maintenance and disease avoidance. High diversity of the population in the microbiome has also been generally associated with good health. Conversely, a relative lack of diversity is apparent in the microbiome in diseases ranging from obesity to inflammatory bowel disease and types 1 and 2 diabetes. Antibiotics also cause a drastic reduction in the diversity of the microbiome which will impair its ability to exclude pathogens. Disruption of the microbiome by antibiotics is frequently associated with diarrhoea, altered gastrointestinal physiology, and abnormal carbohydrate metabolism. This can put an individual at risk for developing infections from an opportunistic pathogen, such as C. difficile or C. albicans. Antibiotic use in low-birth-weight neonates can contribute to the onset of necrotizing enterocolitis, a disease in which microbial dysbiosis is considered to directly contribute to disease onset. Likewise, epidemiologic studies link multiple courses of antibiotics in early childhood with increased risk of Crohn’s disease. From animal studies, it is known that different microbial populations can dramatically affect susceptibility to chronic inflammation. The presence of microorganisms that convert compounds in the gastrointestinal lumen into potential carcinogens is an increased risk for cancer and can lead to adverse responses to chemotherapeutic agents. The lack of sufficient diversity in the microbiome appears to diminish its ability to withstand perturbation. Individuals with a reduced diversity in the microbiome may be more susceptible to developing different diseases . Thus, the resistance of a microbiome to stress and perturbation and its ability to recover to a healthy functional profile afterwards are among the potential properties that characterize a healthy microbiome. If the universal features of the healthy microbiome could be defined, then their absence may be a useful predictor of disease onset. The complete microbiome could be monitored for health maintenance or departures into disease. This would make it possible to determine the appropriate interventions to restore health after dysbiosis, ranging from dietary or lifestyle changes through prebiotics, probiotics or microbially targeted pharmaceuticals . The microbiome is a very large population of microorganisms located in the gastrointestinal tract, predominantly in the colon. The number of bacteria in the microbiome is probably greater than the total number of cells in the body and plays an important role in health maintenance and disease avoidance. The microbiome develops in the human infant immediately after birth and is initially influenced by the birth process, vaginal birth or caesarean section. Further development of the microbiome depends upon the nutrition of the infant. Breast feeding supplies HMO which help establish an effective microbiome. Formula fed infants lack this advantage. The microbiome has multiple effects and interacts with immune regulation, the endocrine system, the brain and the central nervous system (Figure 1). 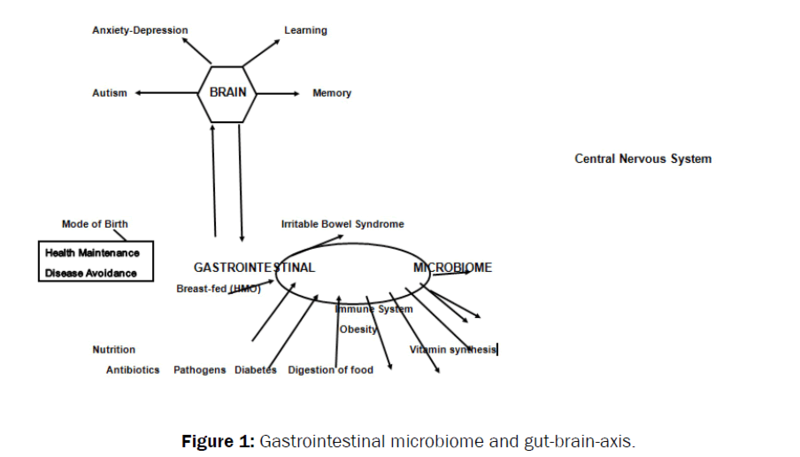 Figure 1: Gastrointestinal microbiome and gut-brain-axis. This has led to the development of concept of microbiome-gut-brain axis. Evidence suggests the microbiome plays a key role in brain functioning, ranging from cognition to anxiety, mood, and sociability. It is remarkable that the microbiome can exert effects in locations remote from the gastrointestinal tract. Thus, the microbiome is a target for therapeutic intervention for several health problems, ranging from various gastrointestinal disorders, a range of developmental indices from cognition to anxiety, mood, and sociability and cancer therapy. Dietary components such as protein, fats, digestible and non-digestible carbohydrates, prebiotics, and polyphenols all induce shifts in the microbiome. The close relationship between diet, the microbiome, and health suggests that dietary modulation of the microbiome may guide the formation of health promoting microbiomes that could then be maintained throughout the lifespan. Therefore, nutrition also now needs to be directed towards efficient management of the microbiome. In the future we need to consider nutrition as a supply of nutrients for the human body and also as a supply of nutrients for the microbiome. It is well established that an optimal functioning of the microbiome will make a major improvement in health maintenance and disease avoidance. Anderson P, et al. Survey of digestive health across Europe: Final report. Part 2: The economic impact and burden of digestive disorders. United European Gastroenterology Journal. 2014; 2: 544–546. Parker, S. Digestive Diseases: The Facts. Fuchs SSR. and Milo R. Are we really vastly outnumbered? Revisiting the ratio of bacterial to host cells in humans. Cell 2016;164:337-340. Leung K. and Thuret S. Gut microbiota: a modulator of brain plasticity and cognitive function in ageing. Healthcare, 2015;3:898-916. Le Blanc JG, et al. Bacteria as vitamin suppliers to their host: a gut microbiota perspective. Current Opinion in Biotechnology, 2013;24:160–168. David LA, et al. Diet rapidly and reproducibly alters the human gut microbiome. Nature. 2014;505:559-563. Conlon MA and Bird AR. The impact of diet and lifestyle on gut microbiota and human health. Nutrients. 2015;7:17-44. Ursell LK, et al. Defining the human microbiome. Nutrition Reviews, 70: suppl_1. 2012;S38–S44. Yang I, et al. The infant microbiome: implications for infant health and neurocognitive development. Nursing Research. 2016;65:76–88. Thomson P and Garrido D. Human milk oligosaccharides and health promotion through the gut microbiome. in: Dairy in Human Health and Disease Across the Lifespan. eds: Watson, R. R., Collier, R. J. and. Preedy, V. R. Academic Press.. 2012;1:73-86. Zivkovic AM, et al. Human milk glycobiome and its impact on the infant gastrointestinal microbiota. Proceedings of the National Academy of Sciences, 2011;108:4653–4658. Lane JA, et al. The food glycome: A source of protection against pathogen colonization in the gastrointestinal tract. Int J Food Microbiol. 2010;142:1-13. Tanaka M and Nakayama J. Development of the gut microbiota in infancy and its impact on health in later life. Allergology International. 2017;66:515-522. Koenig, JE, et al. Succession of microbial consortia in the developing infant gut microbiome. Proceedings of the National Academy of Science. 2011;1:4578-4585. Singh RK, et al. Influence of diet on the gut microbiome and implications for human health. Journal of Translational Medicine. 2017;15:73. Wu GD, et al. Linking long-term dietary patterns with gut microbial enterotypes. Science. 2011;334:105108. Gibson GR, et al. Dietary modulation of the human colonic microbiota: updating the concept of prebiotics. Nutr Res Rev. 2004;17:259–275. Markowiak P and Slizewska K. Effects of probiotics, prebiotics, and synbiotics on human health. Nutrients. 2017;9:1021. Davila AM, et al. Intestinal luminal nitrogen metabolism: role of the gut microbiota and consequences for the host. Pharmacological Research. 2013;68:95–107. Purchiaroni F, et al. The role of intestinal microbiota and the immune system. Eur Rev Med Pharmacol. 2013;17:323-333. Willing BP and Van K. Host pathways for recognition: establishing gastrointestinal microbiota as relevant in animal health and nutrition. Livestock Science. 2010;133:82-91. O’Mahony SM, et al. Disturbance of the gut microbiota in early-life selectively affects visceral pain in adulthood without impacting cognitive or anxiety-related behaviors in male rats. Neuroscience. 2014;277:885–901. Cryan JF and Dinan TG. Mind-altering microorganisms: The impact of the gut microbiota on brain and behaviour. Nat Rev Neurosci. 2012;13:701–712. Mayer EA, et al. Gut microbes and the brain: Paradigm shift in neuroscience. Journal of Neuroscience. 2014;34:15490–15496. Lawrence K and Hyde J. Microbiome restoration diet improves digestion, cognition and physical and emotional wellbeing. PLoS One. 2017;12:e0179017. Jobin C. Precision medicine using microbiota. Intestinal microbiota influence cancer patient response to immunotherapy. Science. 2018; 369: 32-43. Price, J. L., Abu-Ali, G. and Huttenhower, C. (2016). The healthy human microbiome. Genome Medicine, 8:51-62. Bäckhed, et al. Defining a healthy human gut microbiome: current concepts, future directions, and clinical applications. Cell Host and Microbe. 2012;12:611-622.